Way back in April this year, Imaginarium Art announced they were working on a G1 Wheeljack statue. Now we have our first full reveal of this amazing statue for your viewing pleasure. 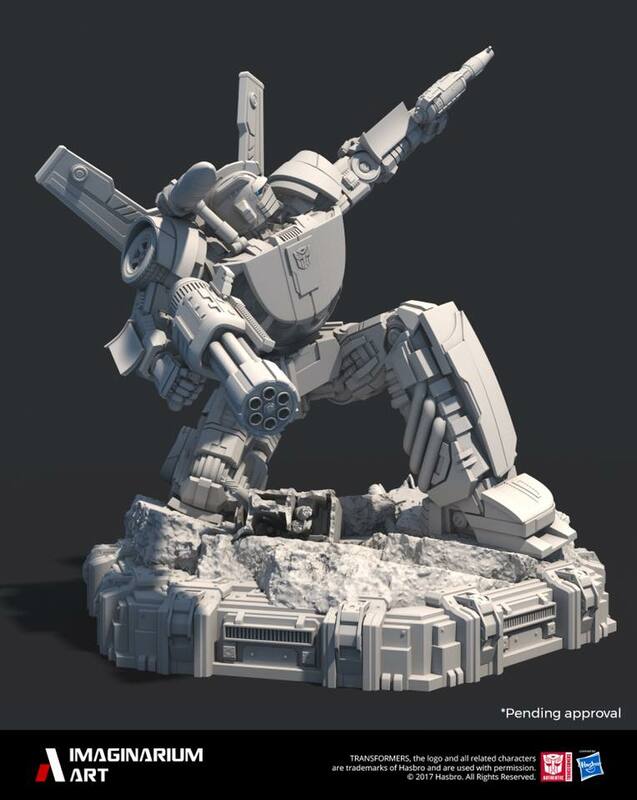 The image was uploaded via Imaginarium Art Facebook and we are sure fans of the Autobot inventor will be pleased. Wheeljack is displayed on a great pose, kneeling on one knee, holding one small gun in one hand and a big rail gun on the other hand. The stylized design looks great and is still recognizable as the G1 character, but with a nice amount of extra details. According to the information shared on the comments on Facebook, the 2 weapons will be switchable for more display options. Wheeljack is part of the “Legacy Of Cybertron” line which is bringing statues of iconic G1 characters. No price or release date yet, but be sure to come back to our forums for more information once it is available. You can check out the picture after the jump and then sound off at the 2005 Boards! That's a fair point, however I'd imagine that the same argument could be said about any toy? They don't feed, clothe or shelter you. And unless you regularly pick up and play with all your figures, the the transforming point is kinda moot, since well, they're just sitting there as much as any statue. I see that but you’d expect a toy to be a toy. While many don’t transform them it’s good to know they can. My main point though is you can’t vary or let the characters interact with just statues. Well it’s not just the price. It’s the price coupled with the fact that it can’t do anything. That my friend is dumb. Not to mention, why would you want to consider the resale value if I even wanted it in the first place? True, these are expensive which is a massive deterrent, however that doesn't make them dumb. Also, as far as "investment" is concerned, the resale value is normally the same or better than what you paid for due to their limited nature. There aren't that many and apart from one DOTM Shockwave, they are all official. Are you sure you don't mean there are so many companies in general making Transformers stuff? Basically anything that transforms and isn't Hasbro/TT, is 3rd party. I wasnt aware Hasbro had a fetish for licensing art. I was under the impression that one company was offical and all the others were 3rd party. I agree with the other guy about them being a poor investment. He wasnt talking about the resell value. He was talking about getting the most bang for your buck. Theres so many statue companies I dont even keep track of which ones are offical or 3rd party anymore. I don’t care if the transformer doesn’t transform as long as it’s got great articulation. This will cost more than a couple model kits and doesn’t even move. I think that’s a poor investment for what you’re getting. So are you saying it wouldnt be cool to see a customizer make this thing transform? Obviously you jumped in the middle of a debate without reading how the other person came at me and started some s**t.
It would be cool, but that's really not how statues work so it's not as feasible to do. I've seen it done on smaller statues but those are more similar to traditional figures so there's more resources to work with. I'd love more action figures than statues, but this isn't made for people who want that. Regardless, some people do buy these statues, hence their limited run and high price. You do realise that Hasbro doesn't let other companies make licensed Transformers that actually transform? I thought the point was kind of obvious. But what I meant is maybe if someone can make one of these statues transform, maybe the companies will start making them transform. They are so lazy. This is made of polystone. Not really the material to be used with any kind of friction. You still didn't answer the question about what point you would be trying to prove? Let people enjoy different things, how about that? No. I don’t think the should have transforming statues. I’ve well supported flame toys drift, their model kits, revoltech and action masters. Statues however, are dumb. Playa you dont know me or my funds so dont be making claims about what I can or cant afford. The only fact you know about me is I like my transformers to transform. Go but this thing, chop it up and make it turn into a car and then we can talk $$$. Uh….i didn't mean to sound like im complaining THAT much about it. I just won't spend a lot of money for a statue. A figure i'm willing to, but i dnt have a lot of room at the moment for staues, however the time put into the designs of the models themselves are cool enough for me to still enjoy.